Summary: We had planned on a 5 day, four night backpack in the upper reaches of the Dark Canyon Plateau in the late fall of 2005. Weather and lack of clean water truncated out trip by one day, but the fall colors were gorgeous. 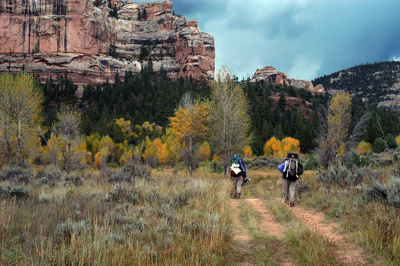 Essentially, the route goes down into the head of Dark Canyon from Big Notch, on the Plateau. Downstream of Horse Pasture Canyon about 2.5 miles, Peavine Canyon joins Dark Canyon from the south. We turned up Peavine and ultimately exiting at the head of Peavine Canyon. The spot is about 3 miles east-southeast of the head of more popular Woodenshoe canyon. How to get there: This is a car shuttle hike, requiring a vehicle at both ends of the trip. Turn off Utah 95 and head to Natural Bridges National Monument. 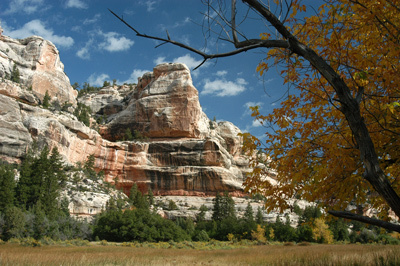 Less than a mile off Hwy 95, take a right onto Elk Mountain Road (BLM Road 228), toward the Bears Ears. After going past the Bears Ears 1.5 miles or so, turn West (left) on to Rd 181 and go about 2.5 miles. The Peavine Canyon trailhead is at NAD 27 12S, 598562 East, 4168495 Northing. Then, return to the Elk Mountain Road. Head northeast by turning left and go about 3.8 miles. Turn left (north) on Road 225 (this now may be called Road 088), and go about 7.3 miles to the Big Notch trailhead (marked as The Notch on some topo maps), NAD 27, 12S, 609102 East, 4178130 Northing. The trailhead parking is limited, so don't expect to park a fleet of vehicles there. Note: after a couple of recent rain storms, most of the roads are covered with extremely slick mud. Even with 4 WD, coming off the Bears Ears can be as much driving excitement as you will ever want. Report: The route down from Big Notch into Dark Canyon descends semi-steeply, about 600 feet per mile. The track (let's not call it a trail) is pretty obvious. When you reach the canyon bottom, the canyon floor is bisected by a deep arroyo. Unfortunately, to stay out of heavy brush, you have to cross this 50 foot deep trench several times. The walls are plenty steep. At some point, you may come to the same conclusion that we did: it is easier, at least for the next mile or so, to stay in the bottom of the arroyo. But watch out for quicksand. I was not paying attention, and got in over my boot tops, always an unpleasant experience. For a map of the entire trip, click here. Given the high elevation of the canyon floor, over 7300 feet, it is not surprising that the "feel" is different, from, say, some of the Cedar Mesa Canyons, such as Slickhorn, Grand Gulch, Owl Creek, etc. Hiking is more akin to going thru a dry forest. The goal was to get to the vicinity of Scorrup Cabin, and it took us about 3 hours 15 minutes. It sounds like a short hike, but after you have driven over 200 miles from Pagosa Springs, just to get to the Natural Bridges turn off, and driving the back roads, and car shuttling, we all seemed ready to be in camp for the night. We scouted for good campsites in the general vicinity and found a nice one at 12S, 603872 Easting, 4180590 Northing. (Note, unless otherwise noted, all locations use the NAD 27 grid, so as to be compatible with paper topo maps.). For those of you not using a GPS, the campsite was located in a small stand of tall pines, about 150 meters upstream and on the opposite side from the cabin. There are some wonderful sandstone shelves over which the water flowing down canyon pours, making for easy water gathering and great bathing. Day 2 of our trip was a scheduled layover day, spent hiking in the very interesting Horse Pasture Canyon. The floor of the canyon is flat and looks like a large pasture. Lots of hoodoos, and interesting fall colors (maples, aspen, and monster Ponderosa Pines) and canyon walls. We were gone five hours day hiking, and the end of the canyon is probably only 2 miles from camp. That says something. We got a look-see inside the Scorrup Cabin too, and viewed the "guest book" inside. There was an entry from July 27, 2005, from a guy from Arizona, who had lived in this cabin the summer of 1943 and 1944. He referred to himself as a "teenage cowboy." Kinda neat. Intermittant sun and showers today drove up the water flow over the rocky shelves by a factor of five or so. We tanked up on water, filling everything we had, in case it rained hard enough to turn the flow from water into thin mud. (This turned out to be a brilliant decision.) Showers drove us into our tents early and doused our camp fire. Day 3: It rained quite a bit during the night, heavily, which would impact the remainder of our trip. Since the clear stream coming down canyon had changed to thin mud, we tanked up with more water than we would normally carry. It took us about 75 minutes to negotiate the first mile downstream of our camp, as the water levels had risen, and they 4WD road in the arroyo bottom continued to cross the creek bed, and was basically a track thru mud. Lovely. Eventually, the track climbs back up on the bench and moves along much better. With the slow going immediately downstream of camp, it took us 2 hours to get from our campsite to the mouth of Peavine canyon. It is at least 5.5 miles from the mouth up to the mouth of Kigalia Canyon, near where we camped, which required about 3 hours, including a long lunch stop. Skies were dark and showery. In lower Peavine, we ran into some slightly muddy water, but that turned into dark red thin mud as we moved upstream. We had the sense that were it not for the rain, there would have been little to no water, this time of year, in lower Peavine. I was reminded of the line in the country song: "If it wasn't for bad luck, I would have no luck at all.) The canyon itself feels more like forest, with high rock walls on either side. We arrived at camp, a nice spot (12S, 601705 Easting, 4174749 Northing), just as the weather was breaking. Scouting for water was easy. Finding water that was not mud was tough. We did find some puddles, but the water quickly plugged filters. As it continued to clear off, we could feel the temperature plummet, and a campfire was in order, making us hopeful that maybe the rain would depart for good, the mud in the water would settle, and it would be a good day for exploring up Kigalia Canyon. Day 4: A starry cool night, punctuated by coyotes yipping and growling near us gave way to wave after wave of thunderstorms starting at 5:30 am. It bucketed, making our chances of finding potable water locally near zero, so during a break between storms, I went over and talked with Sue and Andy, and we decided that we would bail. A break in the weather around 8:30 am gave us a chance to break camp without it pouring on us. It took a bit over an hour (perhaps two miles above the mouth of Kigalia Canyon) to reach the stock tank. A bit after that, we crossed the springs that Kelsey notes in his write ups. At this time of year, they offered little to quench the thirst. The canyon feels, at this point, like hiking in a tight mountain valley. However, a small flow of water picks up as you move further up canyon. Ultimately, the canyon forks after turning to the west, and the now-trail climbs up what would be the left, or more southwesterly fork. The going was slow because the climb was in steep, slippery mud through gorgeous aspen groves. As we reached the reached the trailhead, we could see storms building again. The monsoon would continue. Options: Based on the comments of other writers, plus our own experience, don't count on much water in Peavine Canyon. Perhaps in the spring, during snowmelt, things would be better. Peavine might make a great side trip during a route down (or up) Dark Canyon using Woodenshoe canyon as the loop. However, our experience in the spring of 2000 was that water was very intermittent in Woodenshoe, such that one would really have to plan campsites accordingly. (In wet years, like 1983, there is water all the way down Woodenshoe.) Note that descriptions in hiking guides make it sound like a sandy slog in Dark Canyon from a point a few miles downstream of the mouth of Peavine to the mouth of Woodenshoe. All this said, Upper Dark canyon makes for a lovely fall color hike, and without rain to muddy the waters, should provide good water. Perhaps an interesting, albeit short, loop trip would be to come in Horse Pasture canyon and exit upper Dark Canyon at Big Notch.